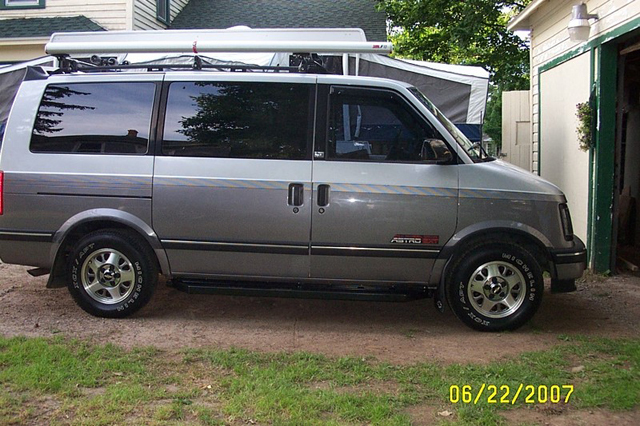 I bought my van back in the Spring of 2004. My wife and I have three children, and needed something that could haul the whole family around! We go camping every Summer. So we needed a lot of room for gear also. A few years earlier I owned a '78 Chevy van and loved it! However it wasn't so great for driving on snow covered country roads! I was only vehicle shopping about an hour, when I found my AWD “mini van”! It had 110,000 miles on it , but was mechanically sound and in great no rust condition. Here's a pic all loaded up for it's first trip to the Adirondacks. My first Winter I was amazed at how awesome these vans go “thru” the snow! These vans are tanks! I often would leave for work before the snowplows got out, but that never stopped me from taking my normal route. I was literally blazing trails and never got stuck! Later I started venturing offroad more, and discovered I “needed” more clearance and bigger tires! 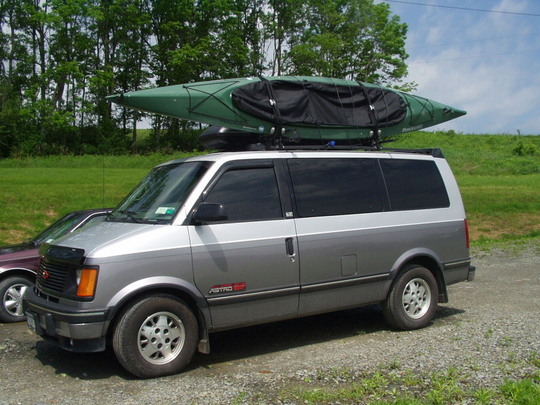 One day I was surfing the internet for some repair info, and stumbled upon Overland Vans! After watching the infamous lifted test van video I was hooked! I came upon all you wonderful folks of the AstroSafari community shortly after. I read up on the wealth of info and dreamed of the day I would put a lift kit on my Astro! 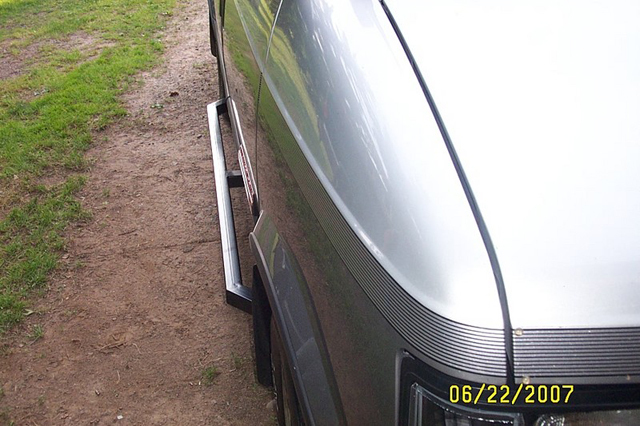 The first significant modification for my van, were the custom rock rails made by Dean Harper. Most of you know him as LiftedAwdAstro! I wanted something to stand on for accessing the roof easier, kayak, cargo carrier , etc. Kind of a cross between a nerf bar and Dean's off road rock rails. Dean has awesome fabrication skills as you can see! This past Summer I finally installed a 5” lift kit from Overland Van's! My van had the fiberglass monoleafs , that were starting to fray. So I logically decided to also install a lift kit when upgrading the leaf springs to steel. Which of course also meant I “needed” new tires & rims! I got some major damage last Fall from hitting a deer! So, when I was rebuilding the front end. I installed a custom bumper from Overland Vans. Definite upcoming mods include, 4.10 gearing and a 2 speed transfer case. Plan to change the bumper some also, didn't have the lift kit when I ordered it. So I need to make some mounting mods, so it fits better. Other than a rear spare tire carrier, future mods will be all interior related for my off road camping plans! As many of us at ASV know, its a forever growing things to do list. 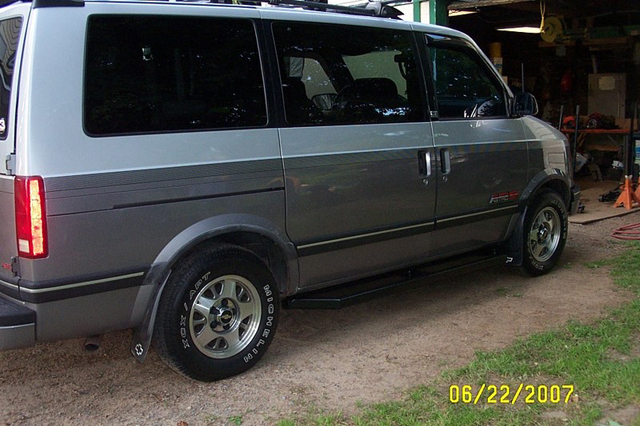 My two favorite addictions, Snapple and my Astro Sport Utility Van! Thanks to everyone from the forum for all the knowledge and inspiration!